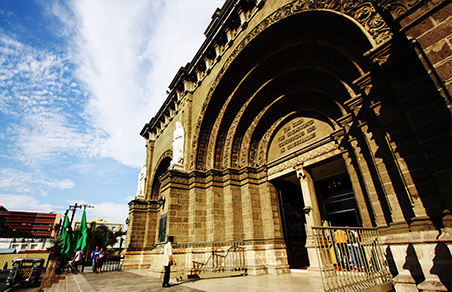 Beneath the imposing rose-glass window, dominating the facade of the Manila Cathedral is the main portal executed in eight bronze panels by Italian sculptors Alessandro Monteleone and Francesco Nagni. Each panel measures 1.80 meters wide by 4.24 meters. The cast-bronze central door displays artistic relief representations of the important episodes in the history of the Manila Cathedral. Two smaller doors, on the left and right side of the main door, are also divided into eight panels depicting the liturgical invocations to Mary.